Ray East and Sam D have moved to Voluspa and live in the Forest of Skotos with their 5 year old daughter and a pet Typhon. They visit Earth with the help of an Empath from time to time. Ray East did her masters in Phsychology from Univeristy of Sussex and has worked as a counselor for adolescents. Sam D used to teach at a SPJC before he moved to Voluspa. Their latest book is Voluspa: A Magical World. Thank you for joining us today, Ray. Can you please start off by telling us a bit about yourself? Firstly I am a total bookworm. I have always loved reading. 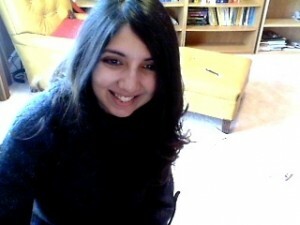 I have worked as a counselor in the past but at present I am a stay at home mom who loves to write in her spare time. I have written all through school and college for local newspapers, neighborhood journals, college periodicals and as such. I think children have more fun and they usually have a more open mind. Besides it so rewarding to be able to write something for children,which would inspire them or catch their imagination. I think so. A younger audience is so much more impressionable when compared to an adult one. You have to be careful what kind of message your book is conveying or what kind of role model your book characters turn out to be. 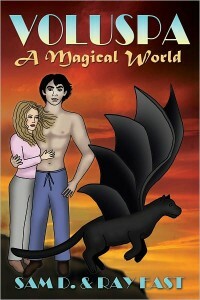 VOLUSPA- A Magical World, is a YA fantasy. It is a crossover between urban fantasy and paranormal romance with a mythological and dystopian twist. This book showcases a unique coming of age story of a fifteen year old girl who struggles with the ramifications of forbidden love, obscure parentage and in essence struggles to find her place in a world that is threatened by her very existence. I wanted to create this magical world which would be fundamentally similar to ours but yet so exotically different that it will capture the fancy of the readers. I also wanted to showcase the character of Amy as a constantly growing, learning, strong individual – a very ordinary girl who chooses an extraordinary life. It’s available in Amazon and Barnes & Noble. I would urge my fans to go and request it at libraries and bookstores. I am at present working on the second book in the Voluspa series. It should be available sometime in November. Thank you for spending time with us today, Ray. We wish you much success. Pump Up Your Book and Sam D. & Ray East are teaming up to give you a chance to win a Kindle Fire! Each person will enter this giveaway by liking, following, subscribing and tweeting about this giveaway through the Rafflecopter form placed on blogs throughout the tour. 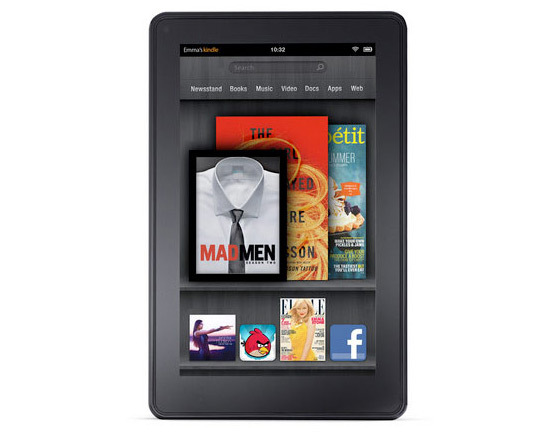 This Kindle Fire promotion will run from August 6 – October 26. Winner will be chosen randomly by Rafflecopter, contacted by email and announced on October 27, 2012. Each blogger who participates in the VOLUSPA: A MAGICAL WORLD VIRTUAL BOOK TOUR is eligible to enter and win. One lucky person who comments the most on Sam D. and Ray East’s blog stops will receive a $50 gift certificate. The blog host who receives the most comments through the tour will also receive a $50 gift certificate! 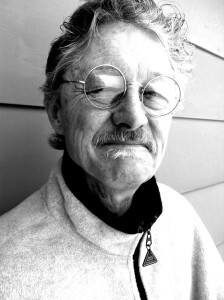 Led by a series of dreams and encouraged by friends, Lynn Hardy began the journey to become an author. She stored her work in a computer file labeled “second job.” Writing began as a passion she could not contain and has become much more than she ever expected. In the Fall of 2010 Prophecy of the Flame – Book One reached #1 on Amazon kindle, shortly after Book Two in the series released. In the spring of 2011,Lynn released the Full Cast unabridged audio book of Book One. Now both fans and newcomers can hear the book come to life as every character jumps of the page with their own unique voice. In reality,Lynn is overcome with compassion for families who are suffering through the recession and so she has created Agape Assistance – Shelter for Families One Book at a Time. (AgapeAssistance.org) Prophecy of the Flame has now attracted the attention of Hollywood. With 100% of the proceeds from Book One in the series going to Agape Assistance, there is now a full length movie now in the works. Lynn has attended many science fiction conventions and has had the privilege of serving on panels about writing. Renaissance fairs are another favorite event for the author. Seeing others dressed in costume (as she always is during book signings) makes her feel right at home. Meeting other writers at these conventions and events who are struggling to break into the publishing field has led Lynn to merge Resilient Publishing with Borderline – a unique type of publisher that offers the individual attention to their authors that the big publishing houses give, with the control and increased payouts of self-publishing. 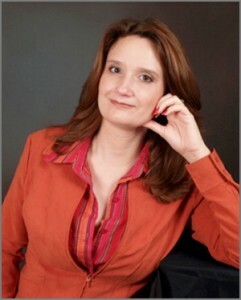 As marketing director of Borderline, Lynn is blazing a new path for authors to follow. The road has been longer and more complicated than she would have ever guessed–not always smooth, but filled with wonderful surprises. Like most stories,Lynn is sure that her journey has only just begun. Visit her website at www.lynnhardy.com. 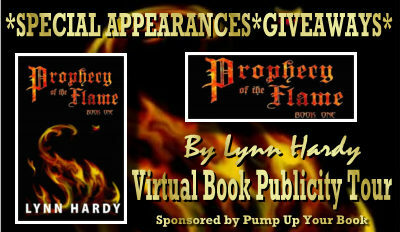 Joining us today is Lynn Hardy, author of Prophecy of the Flame. This is a children’s book geared toward ages 12 and above. Thank you for joining us today, Lynn. Can you please start off by telling us a bit about yourself? I am a stay-at-home, mother of two. I love horseback riding and scuba diving. I began writing in high school. I even majored in Journalism in college, though I didn’t complete my degree. I didn’t actually intend to write a YA teen novel. I thought I was writing a fantasy book for women who had really enjoyed Harry Potter and were looking for their next fantasy fix. I was quite shocked to hear how much it appealed to teens. I don’t believe any writing style is harder, just different. I think to write for very young kids, say, between the ages of 6-10 that you need to be very in tune with the way a kid’s mind works. What appeals and is important to kids in stories may be very different than what we, as adults think in important. My favorite part about being read by young people is that I get to be a part of someone’s life as they are growing and developing. Prophecy of the Flame is about five strangers that are zapped into a magical world and changed into their gaming characters. One guy gets to be a dwarf, another, turns into an elf. The main character becomes the most powerful sorceress on the planet. These guys call themselves, the Crusaders of the Light. They blend 20th century magic and sorcery to defend the Kingdom of Cuthburan from some pretty nasty invaders. I had this amazing set of dreams. If you changed the order and filled in the blanks, it made an awesome story. Amazon has it, of course. But I also sell it on my website. If people pick up a copy at LynnHardy.com and send me an email, I’ll sign it before I send it off. My website has tons of Prophecy Paraphernalia at an online store I created. You can get posters, buttons, even a Fire Ball Ring. If you look real hard, you may find a secrete website that is revealed on the secrete track of the Full Cast Audio Book of Prophecy of the Flame – Book One. Right now I am finishing up the screenplay based on Book One. A producer has stepped forward and we have launched the Prophecy Project to produce the move. 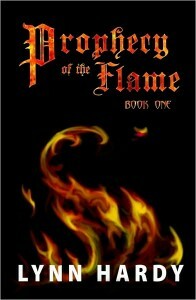 ProphecyoftheFlame.com has lots of great information about the Prophecy Project. Did I mention that there are voice actors from DragonBall Z, Tekken, and even the guy who plays Iron Man on the cartoon as characters in the audio book? The only way to get an audio book is by donating to Agape Assistance. The audio book was made for the charity. You can find the audio book at LynnHardy.com or at AgapeAssistance.org. Thank you for spending time with us today, Lynn. We wish you much success. No, it not a religious nut job’s agenda or an end of the world group. The Prophecy Project is trying to revolutionize the way we are entertained, specifically with movies. How would you like to go to a movie and know that somewhere, a family who has hit a rough patch, lost their job, and are homeless, will be given a hand up – not a hand out? That a family will be back on its feet and self-sufficient in six months? The Prophecy Project will produce a full-length fantasy film, like Lord of the Rings or Harry Potter, based on the Kindle Bestseller, Prophecy of the Flame – Book One. Lynn Hardy, the author of the book, has dedicated 100% of the proceeds from the first book in her series to a charity that helps homeless families with children. This includes the author proceeds from the movie, too! Recently,Lynn has heard from a MAJOR DIRECTOR, one who was nominated for an ACADEMY AWARD…Hollywoodis watching the kickstarter event she launched. If there is support for the Prophecy Project, if the event is a success and shows that thousands of people are waiting for the movie then the big boys will come in with millions to make a fantastic, blockbuster movie! With that kind of support, the Prophecy Project will launch a quality film. Thousands of families will have a warm bed for their kids, all across the country, with the small percentage the charity gets from a film of this caliper. But we need your help. What can you do? As little as $1 donated to the Prophecy Project Kickstarter event will tell Hollywood producers that you want this movie to be made. For your donation, you will be emailed a CRUSADER CERTIFICATE from the PROPHECY PROJECT so that the world will know that YOU made this happen, that YOU helped homeless families get a warm bed for their kids. You can also help by spreading the word. Repost this guest post on your blog or share this blog with your friends. Email friends and family and let them know about this movement that is spreading across America. THE SUCCESS OF THIS EVENT LIES IN YOUR HANDS.